Co-owned by Jake Ledlow and Ryan Allerkamp with a combined 80+ years of experience with Tech included, we specialize in Telephone Entry Systems, Card Access Systems, Vehicle Gates, and all types of fencing. We offer all kinds of telephone entry systems to suit your specific needs. From pin-pads to intercoms, we provide the best way for you to communicate with guests at your gate. Our card access systems use the latest technology for your highest security. Contact us today for a free quote. 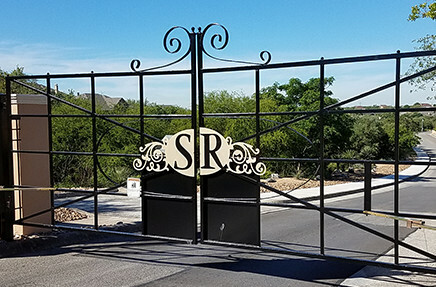 We build custom residential and commercial gates that meet your needs and preferences. Send us a message to share your vision, and we’ll create the perfect gate for you. We would love to collaborate with you and design a fence that’s best for you. Some of our fencing options include stucco, rock columns, cedar privacy, chain link, and wrought iron, to name a few. San Antonio, New Bruanfels, San Marcos, and surrounding areas. Prices include tax and have no hidden cost.